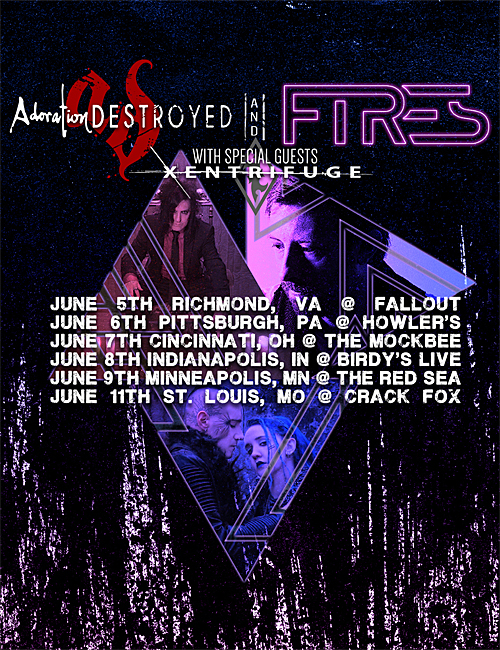 Adoration Destroyed and Fires to Co-Headline Tour in June w/ Xentrifuge – Cleopatra Records, Inc.
Adoration Destroyed and FIRES will be sharing the headlining spot on an upcoming mini-tour, spanning six dates in June. Joining them as the supporting act is Xentrifuge, making for a triple shot of scathing electro/industrial energy. The tour begins on June 5 in Richmond, VA and concludes on June 11 in St. Louis, MO; a full listing of tour dates can be found via the artists� websites. Headed by Erik Gustafson, who is currently on tour as live guitarist for Grendel, Adoration Destroyed released the Ritual Deconstruction remix EP in August of 2017 via Cleopatra Records. FIRES, the new outlet of ex-Cryogen Second front man Eric Sochocki, released its debut album Red Goes Grey on Metropolis Records in September. Xentrifuge released Desensitized Parallels in March, also on Cleopatria Records.